I’m really happy with them. I love the mint color, the design and the texture. Okay, let’s talk sources. 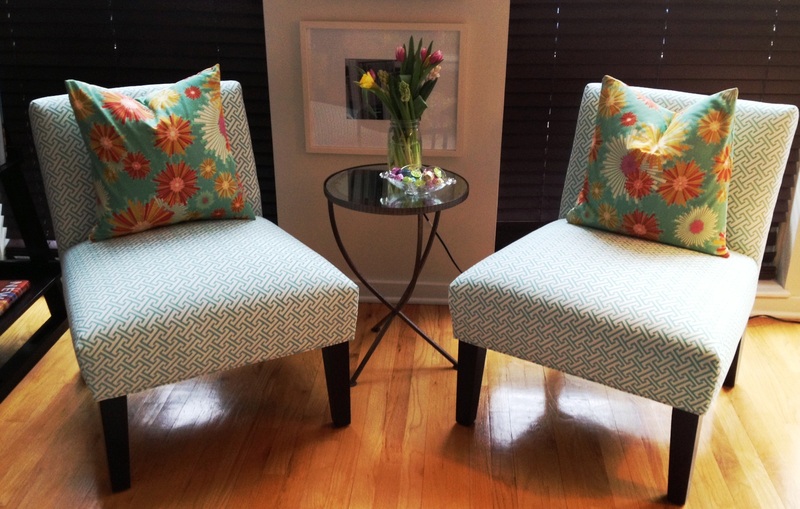 I live in Chicago and used Jorge’s Upholstery. They offer competitive prices, they came highly referred and they do great work. I have since used them for other projects that turned out great as well. I also love that it’s a family business. I just met Jorge’s son the other day and he’s great. As I mentioned above, I purchased fabric by the yard from Caitlin Wilson Textiles. She just launched her new Spring line and has some AMAZING new patterns, including some fabulous gold Chinese patterns which I am in love with. Ugh. Textiles have my heart right now. The pillows. 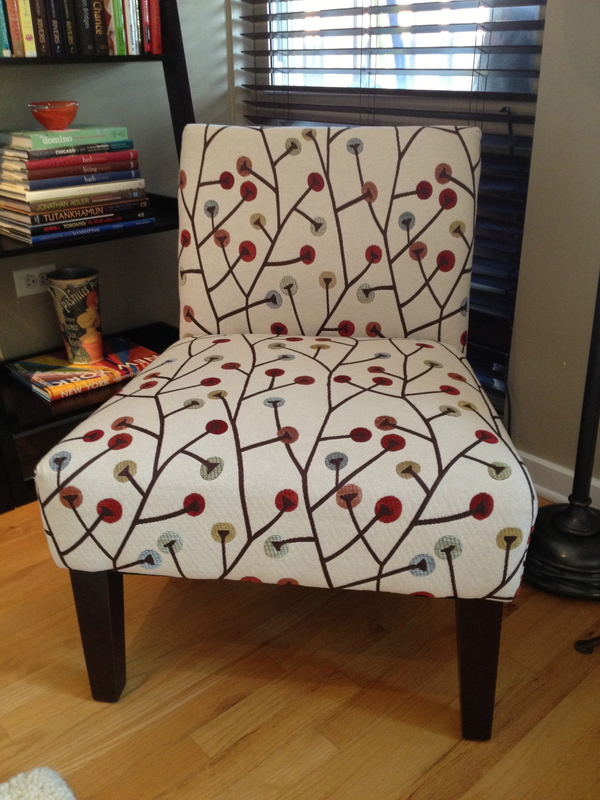 I scooped up this Spring fabric at The Needle Shop on Lincoln Avenue in Chicago for a mere $15/yard which is a steal. And most of their fabrics are actually really well-priced and good quality (not for furniture…more pillows/clothes/purses type of fabric). 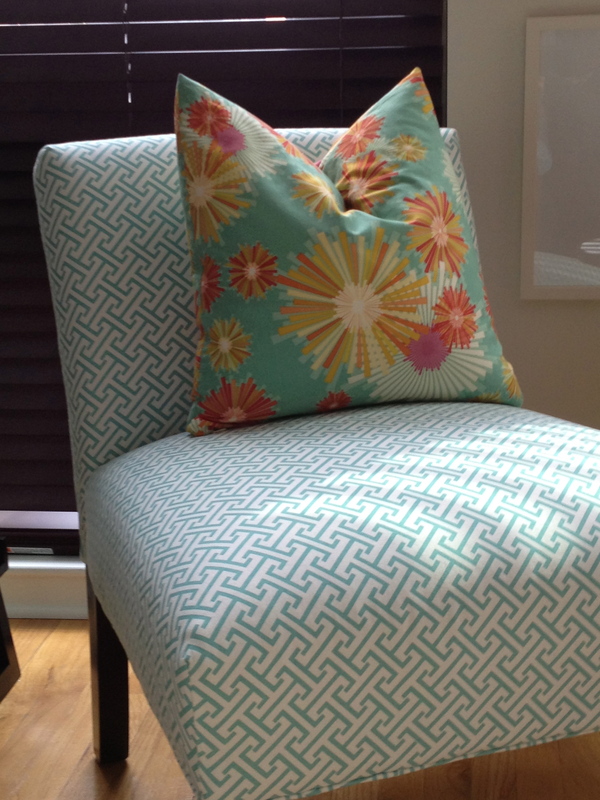 I love the contrasting bold pattern and pop of additional color against the chair. And I used their recommendation of Linda Fryling to make the pillows and she was fantastic. Highly recommend. 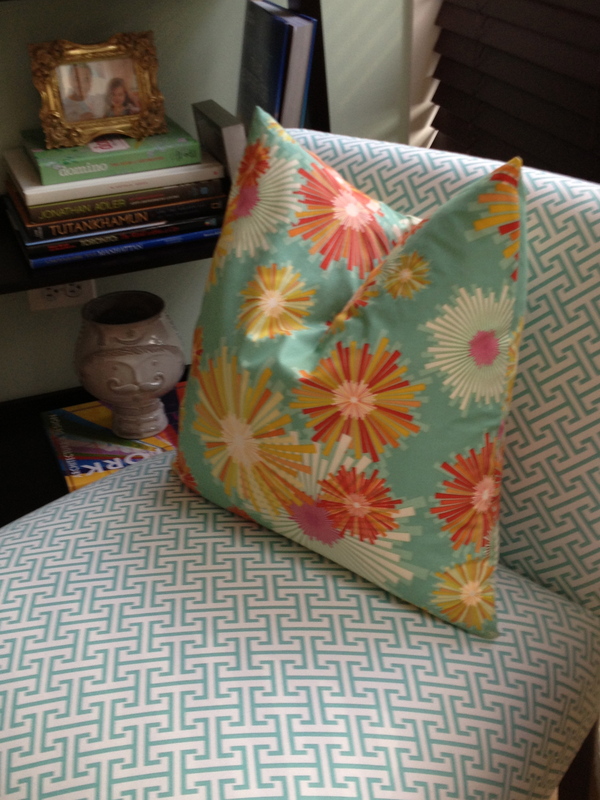 She’s talented and yes, while pillows are generally an easy project, mine turned out perfect. I have more to share, stay tuned! I LOVE that mint pattern design! I love the pattern on your ‘new’ slipper chairs. It looks similar to some fabric that I’ve been looking at for a reupholstery job in my home. It also reminds me of patterns on pillows that I’ve seen in Serena & Lily. And, finding the right company to do the work is important. GREAT JOB!